Did the singer secretly convert to the Muslim religion? Janet Jackson has been full of surprises over the last few months: first, calling off her world tour to focus on her family life; second, her pregnancy shocker at age 50; and now, the singer appears to have converted to the Muslim religion. 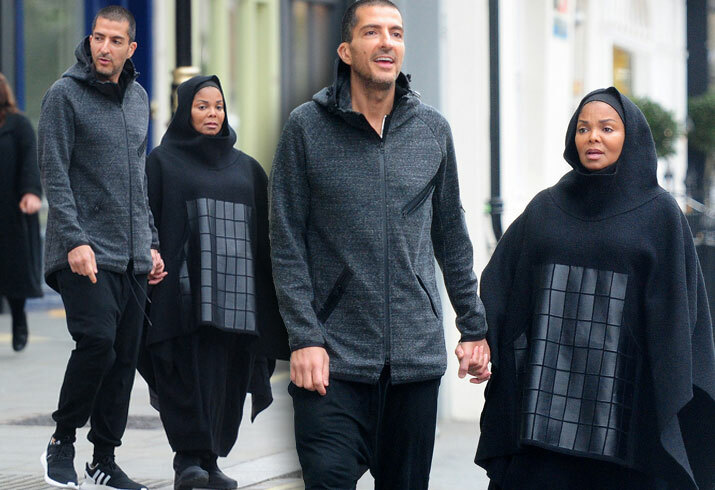 Janet stepped out for a stroll in London with her husband Wissam Al Mana on Oct. 22 wearing an Islamic dress. As she and Wissam, 41, held hands nearby their home in London, Janet continued to look emotionally stressed about her pregnancy drama. An insider told RadarOnline.com, "It seems like she's not loving this as much as she thought she would" and has been feeling "absolutely miserable!" "She's constantly commenting on how big she's gotten and, although her family tells her that it is just baby weight and will go away, she doesn't seem to believe it," added the source. Star previously reported that rarely-seen star was last spotted at the end of September showing her new curves as her baby bump grows. What do you think about Janet adopting her husband's culture? Tweet us your thoughts!